Even with the briefest of glances one can see that the world doesn’t pursue peace. Newspaper columns and Internet sites bulge with stories illustrating the difficulty of pursuing peace. While peaceful ideas abound we remain in an unpeaceful mess. Finding ourselves surrounded by battles at home, church, neighborhoods and countries we wonder is it possible to strive for peace in a world that ricochets from battle to battle? The world of the Hebrew writer, written around A.D. 68, was fraught with turmoil, unrest, discontent, jealousy and vindictiveness. It appears that human nature has endured through the centuries! If this is the case, is there any hope for us, as 21st century Jesus followers? Absolutely! Strive for peace with everyone. It’s not a suggestion but a command with the implication that the goal is attainable. Human nature, or that uncomfortable word, sin, causes us to fall short. For many of us our natural instinct is not peace striving but defensive strategizing! Perhaps a negative word has been said or the appropriate appreciation wasn’t given for that large donation. Maybe a neighbor encroached on a boundary line or a spouse cheated. When we perceive an injustice we can quickly become strategists for our defense. And sometimes we don’t stop with just the battle. Having conquered our enemy we continue picking at the resulting wound reminding ourselves of how sorely we were wronged, tilling the soil and planting the root of bitterness. Striving for peace with everyone seems impossible. Nevertheless, the Hebrew writer encourages; strive for peace with everyone--don’t grow bitter weeds! 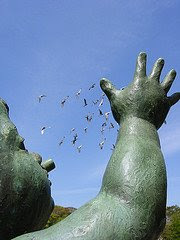 Striving indicates movement and like a regular routine of exercise a conscious choice of peaceful striving is required. In the beginningresults aren’t apparent but soon our spiritual muscles are strengthened and we will find that our impossible has become God’s possible. Jesus, you lived a life of peaceful striving. towards being at peace with everyone. Welcome back! I have looked forward to reading your weekday blogs of inspiration, challenge, and encouragement. Thank you for sharing what the Spirit teaches you with us.